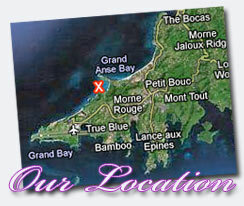 We are located on the island of Grenada, at the southern end of the Caribbean chain. Our resort is just 5 miles from the Maurice Bishop International Airport (MBIA) tucked away on a nearly empty beach in a splendid quiet cove. From this tranquil location you can visit shopping malls just a couple of minutes away, and the world famous Grand Anse Beach is literally a stonethrow away. Our picturesque capital of St. George’s, is a mere 10 minute drive away. We are within perfect reach of Grenada’s numerous beaches, restaurants, shopping centres, banks, museums, rum factories and the golf course. What more can you ask for from a ‘Kalinago’ vacation. Grenada’s “Maurice Bishop International Airport (MBIA)” has regular service, both commercial and private jets, from around the world. Smaller, inter-island carriers connect Grenada to the other islands. Want Cheap Tickets – Visit Globester.com and get the best airfare deals.